Music teacher Peter Antony teaches how music can be a pathway to success and college. 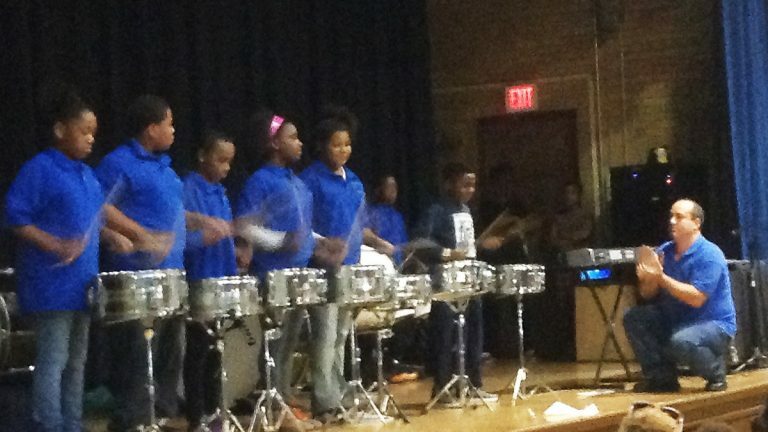 The Drumline at Elbert-Palmer Elementary School in the Southbridge section of Wilmington is undoubtedly one of the most popular extra curricular activities. Music teacher Peter Antony is the conductor. “If they have the passion behind what they do, they’ll have enough dedication to get the precision to become a true professional,” said Antony. His goal for his students is twofold: give them an appreciation for music and the discipline to work hard on whatever they pursue. Antony said he didn’t intend to become a music teacher, “Music was a fall back. I wanted to be in sports medicine and it turned out that wasn’t my calling.” However, music is what helped him get to college, and he hopes his young students at Elbert-Palmer can benefit from a music education in that way too. “Music has given me the possibility of scholarships for college,” said former Elbert-Palmer Student Morgan Bonds. So it looks like Antony’s methods are working.